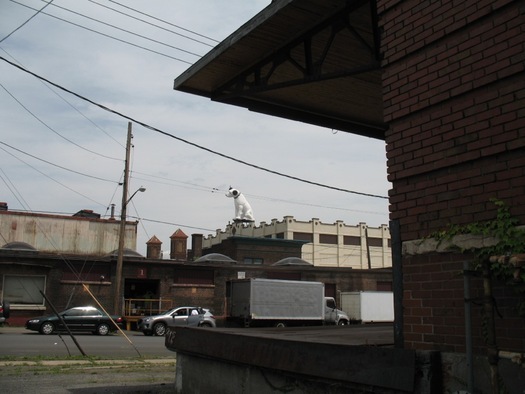 Nipper has a good view of the parking spaces. 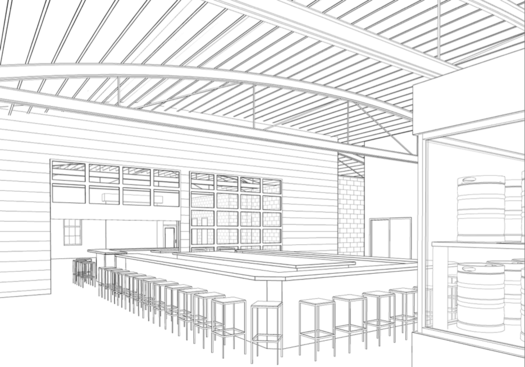 So, here's a little bit more info about that wine bar project -- and also a quick look at an issue that could potentially complicate development in the neighborhood. The wine bar proposed for 897 Broadway, next to Wolff's, will be called Vintage, owner Mike Graney told us Thursday night. He already owns Stout across the street, and he said Vintage is a bid to add something different to the growing scene there that already includes his place, Wolff's Biergarten, The Barrel Saloon, Nine Pine Cider Works, and Druthers. "We're trying attract people who want to have a nice glass of wine and not have sit in a stuffy area, small space," Graney said, referencing the large indoor/outdoor patio space he's hoping create at the front of the building by punching holes in street-facing wall and adding skylights. "With the open area that we're going to create -- and that's the advantage we have with the size of the building -- that's what we're going to try to do." Graney said Vintage will have a limited food menu, something along the lines of tapas. And he compared the concept to Lucas Confectionery in Troy, for which he had praise. The idea is to give people some options in the neighborhood. "We want them to go within a quarter mile, and be able to walk around and see different venues and offer them different things," Graney explained. "We kid about it -- the guys will be at the Biergarten having a beer and the wife will be next door having a wine." The site plan approvals for the 960 Broadway residential/restaurant project and the wine bar at 897 Broadway are contingent on the developers demonstrating they meet the parking requirements under the new Warehouse District Residential and Commercial Overlay, which is aimed at smoothing the way for uses such as restaurants, retail, and residential along the neighborhood's main corridors. 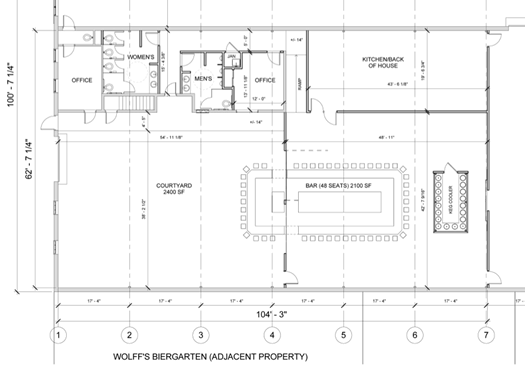 In the case of 960 Broadway, a representative for developer Bill Barber told the planning board they had just that day reached an agreement to use parking at the nearby Arnoff Moving property. So it's just a matter of producing the agreement for the city. 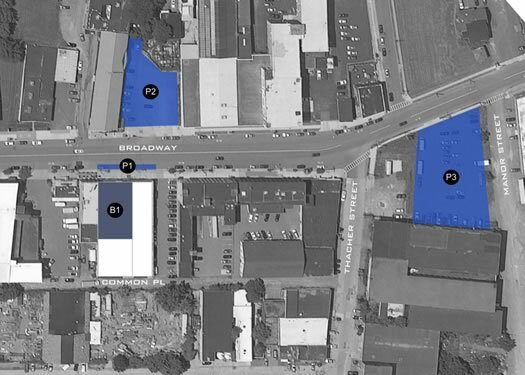 The parking site plan filed with application for 897 Broadway. Working out the parking for the wine bar project might be a bit more involved. Much of the discussion before the planning board Thursday night focused on this issue, specifically whether Graney's proposed options -- shared use of the Stout parking lot, along with night use of parking lot up street that belongs to All-Lifts -- would cover the 57 required spots. Ultimately, the board agreed the project could hit target within 10 percent of that number, and allowed them to work out the specifics with the city. "They have a very interesting conundrum in the Warehouse District with the number of different uses that want to go in there. It's the hot, new spot that everyone wants to be in. When that happens, activity follows. And parking is never an easy solution," said Jeff Buell of Sequence Development, who is working with Graney on the Vintage project. "I think the overlay is trying to create a neighborhood. But you can't create a neighborhood with parking lots everywhere. You disrupt the activity, you disrupt the feel of it, it becomes homogenized." Buell added that he thought the city's parking requirements for the neighborhood, even under the new overlay rules, are a bit high. But he praised the city for being flexible and allowing things like shared use of parking lots. We talked with Christopher Spencer, Albany's planning director, about the parking issue in the Warehouse District after Thursday's meeting. He's said it's something that's come up, but businesses are working through it. "What you're seeing is a lot of cooperation and collaboration between property owners -- owners that have lots available during the night are making them available to other developments," Spencer said. "That's what we're encouraging people to do. Come through, give it a lot of thought, give it some creativity, and figure out how people are going to get to your business -- and how you can achieve that without tearing down a building and building more parking lots." But if projects continue to pop up in the neighborhood -- and there are indications more are on the way -- it does look like there could be a parking space crunch after four, five, six more developments. At some point, there just aren't going to be any more lots available. Spencer acknowledged such a crunch could slow down the pace of new projects. But he said there's still unused capacity in the area. And the city is looking to be flexible about solutions. He pointed to the overlay rules which allow off-street parking that's far as 1,000 feet away (the distance is typically 250 feet), recognition that uses such as kitchen or storage space don't necessarily generate the parking demand that dining room space does, and other allowances for things like mass transit. "That's what we're encouraging people to do. Come through, give it a lot of thought, give it some creativity, and figure out how people are going to get to your business -- and how you can achieve that without tearing down a building and building more parking lots," Spencer said. And if that still isn't enough? Spencer mentioned that it's possible the city could eventually work with the Albany Parking Authority on potential solutions, including some sort of parking structure. And the cost of a parking garage or deck could potentially be funded by developers paying fees if they fall short of parking minimums. I think the area would be just right for a concert and theater venue. There are complaints that The Palace isn't big enough for a REALLY big stage show, so why not build a place? Here's an idea: Stop worrying about parking. @ Shawn: the time when people stop worrying about parking is the time when they choose not to frequent a venue/establishment because it is unavailable. No one lives in the Warehouse District (it's right in the name). Do you propose, a year or two down the line - when the "four, five, six" developments have come to pass - that folks walk from the Pump Station area to get here? A place where - gasp - there is parking infrastructure available? The code exists so that all are treated fairly. When there is no plan? Check out Center Square during the day (state workers, of which I am one) or at night on a busy night, or an event night (which I sometimes attend). There isn't enough on street parking and no one has a lot. They had to institute a sticker system to compensate after-the-fact. Or check out the immediate downtown area during the day. Cars put up every which way sometimes miles away from the destination. Less regulation on the issue isn't the answer. Sorry, Alex, but if you want to park easily and have abundant lots, please stay in the suburbs. Center Square hardly has parking issues, everyone seems to be able to find a space just fine and there are in fact lots available. The fact that no one uses them shows just how little need there is for more parking. Instead of giant, disgusting parking lots, Center Square has beautiful architecture in a pleasant neighborhood that actually draws people to it. This is what we should be aspiring to, not a version of Guilderland that simply appears more urban. Get on the bus, take a cab or stop whining. The fact that the new form based code stuff Albany is working on still includes non-zero parking minimums is a sign of how far behind the times we are. One of the ways the city can mitigate parking concerns (to an extent) is to allow Uber and/or its competitors to operate, giving those who want to go out but not deal with parking more and better options for transportation. Seems like a win-win for the city, its entertainment businesses, and its residents.
" take a cab or stop whining"
This brings up how miserable I've found taxi service in Albany.